Glen Kolotkin has recorded some of the world’s finest musicians, including Santana, Barbra Streisand, Pete Seeger and Jimi Hendrix. He has more than 20 gold and platinum albums to his credit. And he’s looking for new artists to work with. Talking with Glen was fascinating and I would have loved to have heard all his stories of some of my idols. He really has been part of this industry since the start! PlayItLoudMusic: To get started, perhaps you can let me know how you got into the music and entertainment industry and a little bit of background on yourself. Glen Kolotkin: It actually started when I was a kid in high school. I used to be part of a doo-wop singing group. We sang around our neighbourhood and places like that—not really professional, but we wanted to see how good we were so we needed to record ourselves. Of course we couldn’t afford to go to a recording studio. My father bought a disc-cutting machine for me—it must have been made in the ’40s, I guess. People used to have these things in their homes, before tape recorders. So we bought this thing for $10 and you had to buy these blank discs and they came in different qualities. The real good ones had aluminum on the inside and the cheaper ones had cardboard on the inside. It was like an acetate. So I started to record the band. With only one microphone and the fact we had a lead singer and the background group, I bought a little mixer from a local electronics store so I was able to plug two microphones in. I bought another microphone for about $3.98 and started to record our own singing group. When I heard the way we sang, I decided to stay in the recording aspect of it, and give up the singing part. It was kind of a novelty thing at the time and so word got around at school that I could make records at home. All the other doo-wop groups would come over to my house and I’d be making recordings with them. At the end of the session, they would take the record and be able to play it for people. It was 78 rpm. Then when I got out of the army, I really didn’t know what to do. My uncle came over to my house one day and asked me what I planned to do. I told him “I’d really like to get into recording, but I’m not sure how to do it.” He suggested I get the Manhattan Yellow Pages and start calling up recording studios. So that’s what I did, and the first studio listed was A-1 Sound Studios. I called them up and the guy says, “Come on over, I wanna meet ya!” Next day I was in Manhattan meeting this guy Herb Abramson, and it turns out he was one of the original partners in Atlantic Records. So I guess the first job I had was in the original Atlantic Records Sound Studios in Manhattan. Herb taught me a lot about recording. At that time he had a hit record called “Hi-Heel Sneakers” by Tommy Tucker, which later on Elvis Presley went on to have a hit with too. I got to meet Tommy Tucker and I got to work with the Clovers and Screamin’ Jay Hawkins and all those people who had hit records in the late ’50s, early ’60s. They were all hanging out there, so it was quite exciting. PILM: That’s definitely not what you hear these days when people are getting started! Do you play an instrument? GK: No, actually I don’t play anything. People ask me if I play an instrument and I tell them I play all of them! In a sense I guess I do by mixing, as I’m controlling all the instruments. The only musical thing I actually did was being in the musical group as a singer. I wanted to sing bass, but I was the smallest kid on the block and everybody thought that bass singers had to be big and tall. So they wouldn’t let me do bass, even though I had a deeper voice than they did. PILM: That kind of brings a question up about mixing and not playing an instrument necessarily. I’ve noticed that a lot of the time when a mix engineer plays a specific instrument it affects the way they mix things. GK: Oh, definitely! I gotta tell you this story … Later on, I was working in San Francisco with this record company called Beserkley Records and we just finished a record with one of our groups. I think it was Earth Quake. They were out on tour and I was mixing the record with the owner of the record company—this guy Matthew [King Kaufman]—and what we decided to do is make separate mixes for each of the members of the band. So, we made a special mix for the drummer: everything was the same balance as all the other mixes, except on his record the drums were low. Very low—you could barely hear them. Then we made a separate mix for the bass player and on the mixing he was sent, everything was the same level as everything else, except the bass was very low. The same with the guitars … and so on. So we sent cassettes to each of the members of the band, wherever they were touring, and apparently they went to their rooms to listen to the mixes, then they met again in the hotel lobby and said, “What do you think of the mixes?” And the drummer says, “Yeah, the mixes are fine except I can hardly hear the drums!” And the bass player says, “Whaddya mean? The drums are loud as hell, I can hardly hear my bass!” And so it took them a while to figure out what we had done, on purpose. PILM: So was that more for humour or was it in some way to have them focusing on the other instruments? GK: Just because we knew from having worked with these people that each of them always wanted to be louder, you know? One time in New York I was working with this band called Moby Grape, and they were a four-piece band, so we decided, “Okay, we’ll each let them control their own fader on the console—on the mix.” So we had four guys sitting in the studio and in two seconds we were off the scale. Everyone had turned their own instrument up so much that you couldn’t turn it up any more. So we got that out of their system, too. Everybody always wants to hear more of themselves, it seems. Most musicians can’t be objective, at least they couldn’t back then. PILM: Well, that puts you in a good position for not being, perhaps, as biased toward one instrument or another. GK: Right. Most of them always want to hear most of themselves. It always drove me crazy throughout my whole career. That’s what really made me want to get into production, so I could tell myself how the mix should be. Even when I was starting out I was working for all these different producers, and so you had to make the records the way they thought they should sound, and I always hated it to tell you the truth. The reason I got into the business is because I wasn’t happy the way records were sounding and I thought if I became a recording engineer I could make them sound better. It didn’t take long before I found out that you weren’t allowed to make them sound better because you had someone else telling you how they thought things should sound. PILM: What are your thoughts when it comes to recording everyone together in one room, or at least where there is eye contact and body language, as opposed to multi-tracking people on separate days? Is there a difference to the result? GK: Yeah, I think there’s a big difference, because if you get a band that really is a good, competent band and they’re playing together in the same room and have eye contact—as well as, of course, they can hear each other—they work off each other’s energy and you get something magical there. It’s not just a part that’s played correctly, you get a certain emotion that in some ways isn’t the most musically correct but it’s the most exciting, and has the most feeling. But when you do it separately, yeah you can get everything perfect, in perfect pitch, and the tempo is right and everything, but there’s that other element that’s always missing, you know? That’s the difference I hear all the time, so when I record I always like to get them at least to do basic tracks all together, the whole band. We’ll do overdubs later. 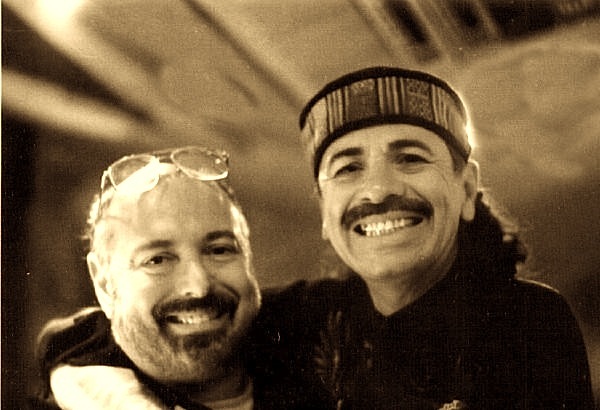 PILM: When you worked on Santana’s Supernatural album, were there any differences in the approach you took? It is a fairly different sounding album to many of his previous recordings. GK: Well, when Carlos asked me to come out and work on the album I was living in New York, so I flew out to the West Coast. Originally they wanted to record using Pro Tools and I never really had much luck with Pro Tools. We started the new sessions using Pro Tools but I just couldn’t get the impact that the old albums had when we recorded directly onto 2-inch tape. Carlos said the same thing, so we switched back to 24-track tape—you know, the 2-inch tape—and it sounded much better that way. That album had several other engineers on it, not just me. A lot of the music on that album I found a little foreign—you know, the rap stuff and all that—but I was doing mostly the Latin stuff. The album opens up with one of the tunes that I had recorded, and that we did the traditional way with the whole band in the studio. I don’t know what they did with some of the others because I wasn’t there. PILM: It’s funny—when you listen to the opening track and the others you worked on, they certainly seem a lot more familiar to the listener, at least to myself as a Santana fan, over a lot of the newer-sounding, perhaps more commercial tracks. Talking about digital recording and analog, I’ve noticed that there’s a lot of musicians these days that’ll go into the studio and record while looking at the sound wave on the computer screen. It seems to me that that must have some kind of an effect on the player’s performance. GK: Yeah, it does! I joke around all the time while recording, and the band will say, “What do you think of that one?” and I’ll say, “Well, it looked pretty good!” You know, watching waves move sideways and what not on the screen. People depend on that stuff so much, it’s hard to visualize what we were doing in the old days. PILM: I just find it interesting to what degree that can affect the studio performance considering that when performing live you interact, you don’t just stare at a screen. Is it possible to capture the same energy if you’re “visually” playing? GK: I don’t think so, because I think you should be devoting all your efforts to the performance! PILM: And, in your experience, if someone was to do fifty takes of one particular track, is it really worth it? Is there a difference in energy from the first takes to the last takes? GK: No, it’s not worth it and I really think people are playing games with their own heads. PILM: It definitely makes sense to me. At the end of the day, when music is performed live, it’s the first take of each song—performers don’t play the same song ten times over until they feel it’s perfect! GK: Yeah, you know, it’s amazing. The other day I was looking at the movie Woodstock, and I worked with a lot of the people that played in Woodstock. I worked with Jimi Hendrix and Janis Joplin and Santana and Sly Stone—they had all these people together, one after another in the movie, and the performances were great! Even though technically they weren’t perfect, it was exciting just to watch those performances. You know, like a one-take performance, I guess. I’m sure all the artists didn’t really love their performance at Woodstock, but it certainly was exciting and it certainly helped make all of their careers. PILM: Absolutely! It’s a moment that’s being captured and its energy! We were talking about how you can spend hours getting sounds, and these days the studio is used to create so much of a band’s sound, however do you feel that bands are able to reproduce their recording live? GK: Well, you never really can, because don’t forget in recording, you’re doing a lot of overdubs and different parts. So you never get it exactly the same as the recording, but you can pretty well simulate it. I thought Santana, the original band, was really good live—I don’t think anything has come along that good, ever. The rest of the band always used to get on Carlos’ case saying, “You always play the same solos!” He always played the same solos that were worked out at the studios, you know. But he was right because that’s what the public want to hear when they see the band live. PILM: You hear people like Dave Gilmour say the same thing, that at the end of the day people want to hear the solos on the record and that’s what they’re paying to go see. PILM: In a way, this leads up to my next question: With such a long career in the industry, could you tell me in your opinion what have been some of the improvements and perhaps some of the things you wish had stayed the same about this business? GK: Back when I got into it, professionally, the bands all had to play competently. They all had to be competent musicians to be in a band because you had to play together, you know? We’ve gone from a 4-track studio where bands had to play together to now, where we have added so many more additional tracks, you could practically phone in your performance. In fact, a lot of times that was actually done—we’d actually send a tape out to another part of the world and a musician would put his part on it and send it back. It’d be perfect, but it wouldn’t have the same feeling, that’s for sure. I think multi-track is good because it gives you more control over the recording and you can get it to sound better, no doubt about it, but as far as performance goes, I don’t think it helped. In fact I think it has deterred, because it has enabled any musician to become a musician. Where you wouldn’t have been able to get into a band at one point, now almost anyone can record and be fixed in the mix. We have devices today that will correct the pitch of people’s singing or playing. You can hook it up and they might have sung out of tune, but you can make it in tune. So a person that couldn’t even be a singer at one point in history now can become a star! PILM: Do you think it has affected the level of musicianship and performance that we see in today’s industry? Or do you think that no matter what, to get to the top, you still have to be the best? GK: No, look at Milli Vanilli. I don’t think it was even them on the recording! PILM: That’s a great example. It’s funny, though, because I think in some ways Milli Vanilli were obviously able to sell themselves based on their performance. And I find it interesting that now—like you said—there’s a lot of people that are recording and being fixed in the mix, so to speak, however, when they go on stage, they don’t have the show either. GK: That’s true. And a lot of the live stage acts are half-recorded anyway. You know, they’re using click tracks to a recording that was made who knows when! Even when we had that hit “I Love Rock N Roll,” I remember Joan Jett’s manager—who was always a frustrated musician—would be behind the stage with a keyboard adding parts to the mix! Most people didn’t even notice it back then, and who knows what you’re actually hearing and seeing today at concerts. PILM: Absolutely! I guess that brings up another question: What was it like jumping from project to project in such short amounts of time and with such a wide variety of styles and genres, not to mention personalities and performances? GK: When I was working in Los Angeles and in New York, I was working for Columbia Records. One day I’d be in New York working with Moby Grape, almost on the verge of heavy metal, the next day we might be doing a Broadway show! One day, your setup would be four musicians, the next day it might be seventy musicians with an arranger, and with a person like Barbra Streisand singing. So it was completely different, but I found it all to be really exciting. I always loved rock ’n’ roll but I also liked traditional music. It was great going from an acid rock band to a Johnny Mathis album. It was a great experience and I got ’em all hanging on the wall! PILM: What are you doing these days? What’s going on in the music world for you? GK: Well, I’m partners with somebody who has a really great studio, some really great equipment and probably the best monitor system I’ve ever used. We have a record label called Cool Music, and we’re looking for new artists, actually, to sign. And naturally, if I’m signing the artist myself, I’m looking for an artist that’s really talented, that has really good, memorable songs. When I was working for someone like Columbia Records or RCA Records or BMG, I had to do whatever they would give me. Some of them were really good, and some of them weren’t so great, but it was still always a challenge to make it sound good. Now I am able to choose the artists I work with. I’m always looking for new, great talent—someone that’s really dedicated, you know? Because I’m dedicated too, and I really love great music and there’s so little of it around apparently these days. PILM: I would have to agree with that. So, if you’re looking for an artist for your label, what is it that makes someone stand out above the rest? What is it that makes you get heard above the noise? GK: Well, it’s the memorability of their songs. I was always right about picking hit records. I heard a new song once or twice and it would keep going around in my mind, you know. A lot of times after that, I’d work on something all night and wouldn’t be able to remember it. But great songs are memorable and if something is memorable, that’s the main thing, for me anyway. PILM: I couldn’t agree more. At the end of the day you can do all kinds of things and say all of the things you want to hype a particular project, but if the music doesn’t stand out, if it’s something you can’t remember, it’s not really worth it. GK: Great music would always give me chills up and down my spine. When I first saw Santana at Woodstock—actually I was in Paris, we were on our honeymoon, it was raining, and we were walking down the Champs-Élysées and I noticed in the movie theatres they had Woodstock playing, so I said to my wife, “Let’s go and watch the movie—at least we will understand the music.” And that’s the first time I ever saw Santana, and I remember thinking “Wow, I’d love to work with them!” After the honeymoon, we went to LA to live and so I never even thought I’d meet Santana, let alone work with them. I ended up doing nine albums with them. PILM: Wow—I can imagine what kind of feeling that must have been. To a lesser degree, I had something similar happen with Sly and the Family Stone. PILM: I was definitely waiting for the punchline! GK: So many things have happened over the years and I have so many stories. I could go on and on and on … It has been an amazing experience. My whole professional life has seemed just like an extension of my hobby. I was on tour with Santana throughout Europe with a number one hit record on the charts and that’s amazing right there, you know. PILM: It sounds to me like there should be a book here somewhere. GK: Well, everyone keeps telling me, “You gotta write a book! You gotta write a book,” but I really don’t have much experience writing. PILM: I can see that. Although I think some of the best books are collaborations.